An antique leather writing box, which belonged to railway engineer Robert Stephenson and was ‘rescued’ from an auction by Viz co-founder Chris Donald, is going under the hammer in Newcastle. The brown leather box, which features Northumberland-born Stephenson’s name and London address in tooled gilt lettering on the top, is one of the treasures on sale at the three-day Anderson & Garland Spring Fine Art and Antiques auction from March 24-26. The case would have been used by the engineer when he was travelling on the railways that he played a fundamental part in creating. The only son of ‘father of the railways’ George Stephenson, Robert developed the world-famous Rocket locomotive, designed Newcastle’s High Level Bridge and the Royal Borders Bridge in Berwick, and worked on the fledgling railway systems across Britain, Europe and Egypt. Chris Donald, a keen railway collector who is currently writing a book about train spotting and obsession, found the writing case at a railwayana auction in Sheffield in the 1990s. He had gone to watch the auction and to bid for an engine name plate. He said: “I believe the case came from a descendant of Stephenson’s, but no-one seemed to be interested. All the people there were train enthusiasts rather than history enthusiasts – they were paying £30,000 for a piece of brass, but they weren’t interested in this case that had been carried and used by the bloke that had built all the railways and the bridges. The Victorian leather-clad box has a lacquered brass handle and opens up to reveal a lockable box with a fitted cut glass inkwell with silver mount by Frances Douglas, London, dated 1844. The box was sold by ‘Edwards, Manufacturer of Writing & Dressing Cases to Her Majesty, 21 Kings Street, Bloomsbury, London’, and has ‘Robert Stephenson, 34 Gloucester Square, Hyde Park, London’ inscribed on the top and on an outer brass plaque. Chris Donald, who describes himself as a “hoarder” who is downsizing, rediscovered the case inside a cardboard box while he was sorting through his model railway collection. 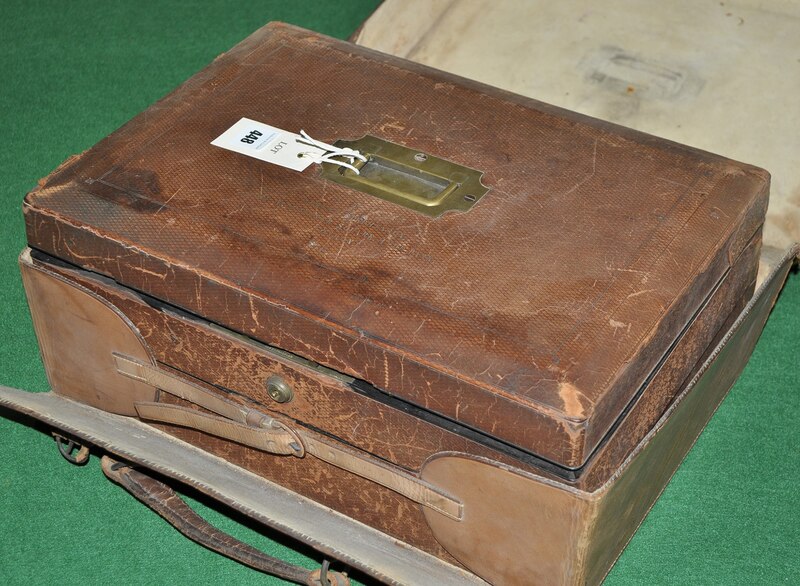 The writing case has an estimated value of £500-£800 and is expected to generate huge interest at the auction. Anderson & Garland auctioneer, Fred Wyrley-Birch, said: “This is an amazing box with loads of history. You can envisage Stephenson sitting at this box, making notes on the country’s railway systems and amending designs for the High Level Bridge. Stephenson moved into Gloucester Square the same year the High Level Bridge was started, so this is more than possible, it’s likely.